The fuzzy image at left is from the Submillimeter Common User Bolometer Array, or SCUBA camera. 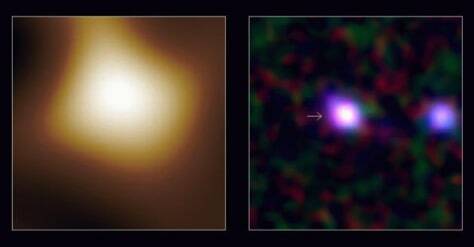 NASA's Spitzer Space Telescope provided the corresponding view at right. The galaxy emitting the radiation detected by SCUBA is shown with an arrow. Astronomers believe the radiation is generated in violent starbursts.